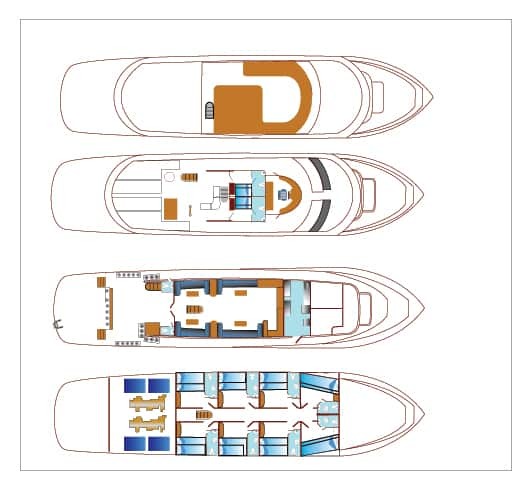 Fully upgraded in 2013, the 27 meters Blue Planet 1 is a great liveaboard choice in order to cruise the Red Sea. Indeed, with a great value for money and plenty of space on-board, the baby of the Blue Planet Liveaboard Fleet won’t disappoint! The boat’s dive cruise itineraries options are various. Indeed, either a mini 3 nights safari and resort stay or a full length, 7 nights, diving cruise are available. As the smallest ship of her fleet, the Blue Planet 1 is perfect for smaller groups. 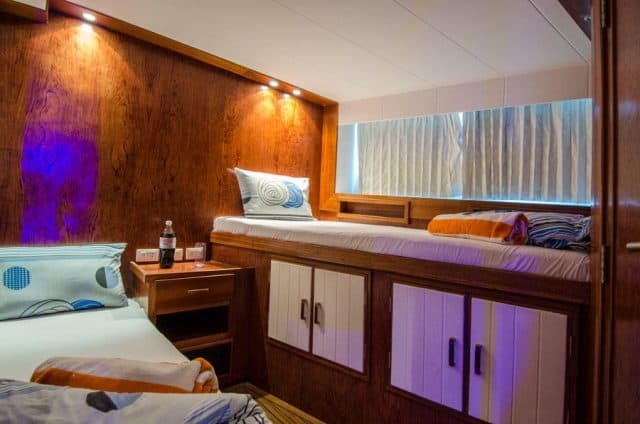 The vessel can welcome up to 15 guests in 8 twin bed cabins. Every cabin is equipped with a complete en-suite bathroom as well as air-conditioning and good storage space. The Blue Planet 1 has many social areas, both indoor and outdoor. Indoors, you can count on a great, lavish dining room as well as ample seating space. Plus, there’s an air-conditioned salon with complete entertainment system and media library. Outdoors, you’ll find 3 sundeck areas. The first one is covered, perfect to read and even take a nap. Furthermore, there are 2 sunbathing sundecks on which you can relax. Cushioned seating and daybeds are all over the place. 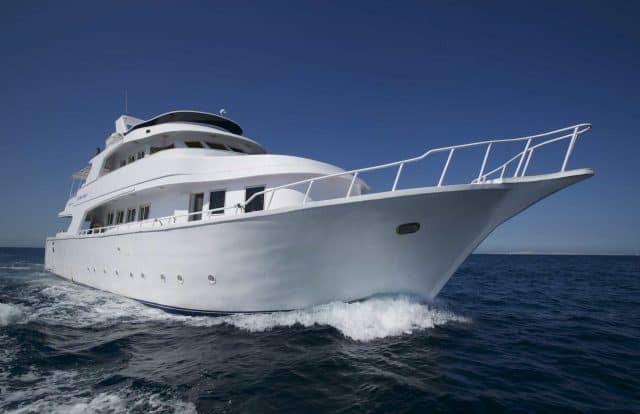 Of course, the liveaboard diving cruise of the Blue Planet 1 includes 3 meals a day, plus the snacks, bottled water and soft drinks as well as tea and coffee. 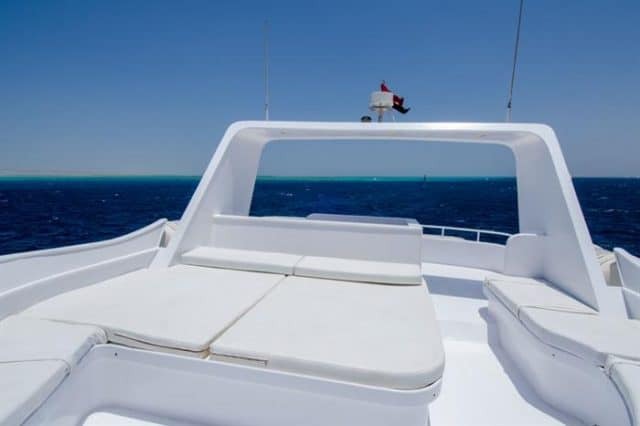 The Blue Planet 1 is sure a great boat, you can compare it to other liveaboards by looking at our Best Liveaboards of the Red Sea… or read below for more details! Watch this video and see exactly how a diving cruise on the BP1 unfolds! The Blue Planet is definitely an elegant and luxurious ship. Nothing compares to it in term of size, it’s one of the smallest liveaboard sailing the Red Sea. That being said, the fact that it’s small means less people so less crowded diving! In term of luxury and service, the Blue Planet 1 is comparable to other vessels in her fleet such as the Blue Seas or the Blue Pearl. The dive deck and dive platform of the Blue Planet 1 have been refurbished along with everything in 2013. It’s more functional than ever and very well organized. Indeed, there is plenty of room for 15 divers to gear up and the dive platform fives easy access to the water. On-deck showers, camera charging stations and personal storage space are among the best features of the vessel. Easy and convenient, that’s how it sounds to dive the Red Sea with the Blue Planet! There are more itineraries and durations available. If you have been diving on board this liveaboard dive boat in Hurghada & Red Sea, please share your review and let us know what you thought. Please post your comments in the review section below, by doing so you will help fellow divers to plan their next diving trip . 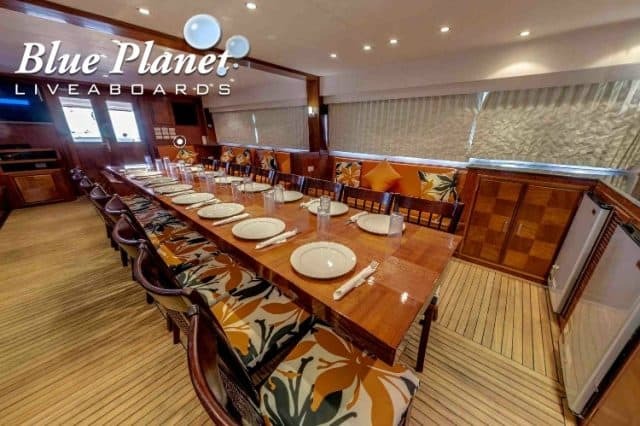 From the Blue Planet Liveaboard Fleet, the Blue Planet 1 is perfect for smaller groups and offers an outstanding value for money!